As a homeowner, the electrical codes keep changing to increase protection for you and your family. You should make sure your home has the proper protection, especially if it was built more than 25 years ago. Experts estimate that over 60% of all deaths from electric shock could be prevented if Ground Fault Circuit Interrupters were installed. GFCI protection should be installed in areas where known electrical shock hazards exist due to its proximity to water or moisture such as outdoor outlets and fixtures, swimming pools, saunas and hot tubs, kitchens, basements, bathrooms and garages. It is also recommended that you install GFCI protection wherever you operate electrically-powered garden equipment (mower, hedge trimmer, edger, etc.) or electric tools (drills, saws, sanders, etc.) for do-it-yourself work in and around the house. Your GFCI outlet are designed to allow for safe and easy testing that you can do. Initially, your electrician should test all receptacles and breakers when he installs them to make sure they are working properly. After that, you should test them monthly to make sure they are working properly and are providing protection from fatal shock. Plug a lamp into the outlet and turn the light on. Press the TEST button (black button above). This should cause the RESET button (red button above) to pop out and the light should turn off. If your RESET button pops out but the light does not turn off, the GFCI has been improperly wired. 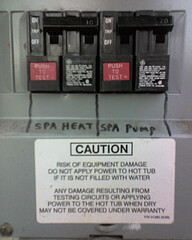 If your RESET button does not pop out, the GFCI is defective and should be replaced. 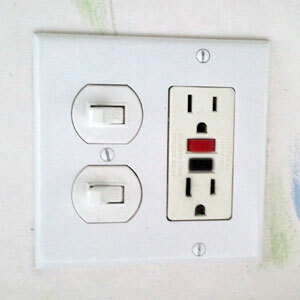 In both cases, contact a qualified, licensed electrician to correct or replace your outlets. More information on GFCI can be found in the GFCI Fact Sheet published by the U.S. Consumer Product Safety Commission.